One thing that this college admissions scandal has highlighted for me is that our kids are at a much higher disadvantage. Paying people to fake college recruitment profiles is so far above the thought process of my students. Many are just trying to figure out how to upload information to the NCAA Clearinghouse in their senior year. No scouts are looking at them and available organized sports are sparse. Having a test administrator change answers on the SAT/ACT or take the test instead of the student is a foreign concept where I'm from. Our kids have to be taught what the SAT/ACT is and receive last ditch effort test prep in the 9th hour in hopes of getting an average score. Paying $500,000 to be accepted into a school and then paying the tuition in full is unbelievable when our families can't understand the intricacies of a financial aid award letter. Can't believe that a school would award $40,000 to their child but the cost of attendance is $50,000. Where is the other $10,000 coming from? Every year. I come from a world of no college savings and little college knowledge. I am a product of such. Many elite institutions will incorporate a student's social economic status within the admissions decision and offer admission based on the applicants ability to pay. In my world hard financial decisions need to be made in order for a child to even leave to attend college. What is financial aid? What is the direct cost? How much financial aid is awarded? Is there need based aid available? Can the student commute to save money? Are there scholarships available? Is there a 10 month payment plan to pay the remaining balance? Questions Questions Questions. And their are people who can pay their way in. Fair? Is it fair? No. Am I surprised? No. For years the wealthy have been able to pay their way into places that they wish. The wealthier you are the more access you have. For me and my students we will continue to push forward, learn about the benefits of college and the financial commitment, apply to schools responsibly and hope that their hard work pays off in the long run. In terms of college financing and "pay to play" the system is broken and has been for a very long time. I say words that motivate. Sometimes harsh. Other times kind but always truth. Most times people need courage. They know what they need to do. They know how to do it, but sometimes they need a push in that right direction. I like to be that push. I like to ignite that fire. Even if they think they don't want me to, I like to push until they take off on their own. There are millions of ways to motivate. People need to hear how they can do it (whatever it is) so they can believe in themselves. Go push someone to greatness. It will make your day I promise. Thank you to all my motivators for without you my life would look so very different. 1. Believe you can do whatever you want! Beyoncé's parents were working class from Houston. They believed in her and she in turn believed in herself. They weren't rich but they built the foundation for her empire. You don't need a fortune to set yourself apart. You don't even need approval from others. What you do need is the mindset that you can achieve anything you put your mind to. 2. You Create your Expertise. Practice. Read. Study. Watch videos. Rehearse. Train. This builds an expert. Beyoncé is an AMAZING performer but is also a very hardworker She consistently and systematically out works herself to become better. The same principle holds true to every area of life especially for families looking for money for College. It is not enough to forward a scholarship link yo your child and expect them yo complete it. It is not enough for you to just do the FAFSA and hope for the best. Getting money for College takes HARD WORK and creativity. You can be the expert. You just have to work for it. 3. Pay Homage. 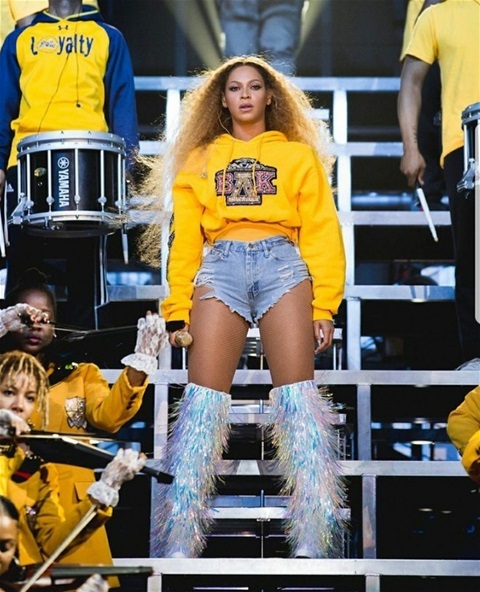 Bey paid homage to those who came before her. Her NOLA roots, Hbcus, marching bands, D9, Queen Nefertiti... My goodness.. there are places in our past that we can seek guidance from and benefit from the strength in our past. When trying to find places to look for College Money take a look backwards. Look at your lineage and heritage. There may be some untapped connections that can lead you in a direction that you may not have before considered. 4. Use Your Village. Beyoncé has always had a team. Her parents, family, Destiny's Child, hubby. She brought member of her team with her to perform last night symbolizing that it takes more than one person to build an empire. Same rings true for us. Money for College is a team effort. Parents have a part to do as well as kids. It's a team effort. I was 18 years old, brand new on the campus of Temple University. It was a new world for me. Though I was still dependent I was going into a largely independent world. I didn't really have much of a care in the world at that time, but I did know that college cost money and money that my family didn't necessarily have to spend. I felt the need to take some financial responsibility. I started working at the age of 14. I worked through all my years in high school and into the summer after graduation. Since I was a local college student (I'm from Philly and Temple is in my town) I decided to secure employment somewhere in the city while I attended college. I lived on campus and worked not one but two jobs during my first year in school. I always had a strong work ethic and enjoyed the chase of getting a job. Interviewing, writing a resume, filling out an application, doing everything I needed to do to prove that I was the right employee for the job. Working was something that came second nature to me. However working while a college student dealing with rigorous academics, a new schedule and brand new independence deemed to be rather challenging. Many times I would work late into the night resulting in my oversleeping for an 8 a.m. class. I worked as a cashier at Cheltenham Mall which was a few miles away from school. I remember catching the "C" bus back down Broad Street to my dorm sometimes 10/11 o'clock at night. I also worked as a clerical and teaching assistant at a local charter school most afternoons. I really enjoyed this work as it was akin to my passion. I was making money to help with college expenses: tuition, fees things that my parents didn't necessarily have to worry about and it fueled my independence. With the increased working hours came it's own set of issues. I worked more than I attended classes at some points. I was working 40 hour weeks. I woukd moss my morning classes and wake up just to go to work at the cgarter school.in the aftenoons, then hop on the sub to go to my evening job at te mall. At times I spent the money that I was supposed to be using for my college expenses on frivolous things. Still made time for my friends though. I overslept often. I worked alot. I partied. I didn't study. I was the epitome of a non-academic person living in a dorm on Temple's campus. I valued my jobs so much more than I valued school and that was almost my downfall. Yes being able to balance school with some sense of responsibility is admirable and skills that many teens should seek to have. But my focus was off. I was in college to learn, not just work and live. It took a long time for me to be able to juggle a healthy school-work balance. Why am I telling you this story? 1. Remember why you are going to college in the first place. College is school. You are there to learn. You are there to earn a degree. 3. Evaluate whether you are working for a need or a want. Is it absolutely necessary for you to hold a job while in college? For some people the answer is yes for most people the answer is no. And if the answer is yes how much money do you really NEED to get by? I wish I would have evaluated my need prior to working so much as a freshman in college. I am happy to say that I overcame and though I worked all 5 (yes 5) years of college I found a way to balance work and school so that I graduated. Even made the dean's list a few times! You can do both it just won't be easy.